As Catholics, we are called to bring as many new souls into the Kingdom of God as we can. We are called to evangelize, and share the Gospels with our fellowman, but the problem is that not many of us know how to convey these truths in an effective and convincing manner. Fear not, for Joe Sixpack — “The Every Catholic Guy” — has come to save the day. 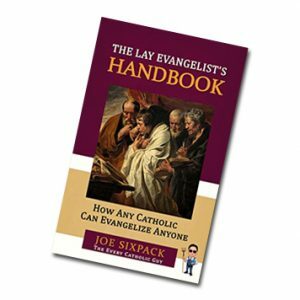 In his new book titled The Lay Evangelist’s Handbook — How Any Catholic Can Evangelize Anyone, Joe Sixpack (not his real name; but we’ll go along with it) brings us a very helpful book that gets down to the facts in a clear and concise manner. While the subject matter is as accurate and serious as any heady theology book, the great thing about this book is how amazingly user-friendly it is. The author starts off with an introduction about why and how to use the book, as well as how to begin with each student you are seeking to evangelize. It is then that we are thrust into a well-written explanation, step-by-step, of The Twelve Articles of the Creed. Much of the book is formatted as a teacher’s guide, basically a teacher’s curriculum that’s ready to use. There are questions and answers throughout each chapter that make it easy for us to read and understand, making it a great companion to both the Bible and the Catechism of the Catholic Church. I will say that this book is as good as — though somewhat obviously different from — the Baltimore Catechism and much more enjoyable. If you are reading The Wanderer, you are more than likely up-to-speed on your faith. If you’re reading The Wanderer for the first time, welcome, and I would certainly encourage you to get a copy of this book, along with a Wanderer subscription, so that you can really be on top of your Catholic game. I don’t know about any of you, but after being a lapsed Catholic for 20 years and coming back into the Church in 2000, I tried to assert myself as some kind of expert on the faith. The worst part was that I totally embarrassed myself with a liberal Catholic regarding some of the rubrics of the Mass. She knew the rubrics better than I did, and she put me in my place — justifiably so. If I’d had a book like this then, I probably would have saved myself the embarrassment. Nevertheless, I continue to learn more every day for my own edification and that I may be able to evangelize my own family, friends, and strangers. Since his own conversion to the Catholic faith about three decades ago, Joe Sixpack has had the zeal to learn and to teach others about the Catholic Church and our faith. For those of you unfamiliar with the Marian Catechist Apostolate — it is a lay association of catechists whom Fr. John A. Hardon, SJ, envisioned as an army of men and women who could promote the Church’s teachings in both traditional and innovative venues. Fr. Hardon’s courses are required for Marian Catechists, and successful completion of these courses guarantees that those catechists know exactly what they are doing when they share the faith with others. Servant of God Fr. Hardon was successful in developing and growing the Marian Catechist Apostolate. Prior to his death in 2000, Fr. Hardon had asked Raymond Leo Cardinal Burke to take over as the international director of the Marian Catechist Apostolate. His Eminence serves in that role to this day. I really enjoyed this book because the author writes in clear lay terms, yet remains reverent to the Gospel and the Scriptures. I think this book can be applied to teaching not only those we wish to evangelize, but to keep ourselves in learning mode. There is much to learn and love about the faith and every little thing helps. Joe Sixpack’s website — www.JoeSixPackAnswers.com — is chockfull of helpful resources and information for both laity and clergy. He offers a terrific bulletin insert program called “What We Believe. . . . Why We Believe It,” which pastors can use at their parishes to better educate their parishioners in the faith. Every Catholic home should own this book, especially if you are raising children. It’s definitely a perfect book for home-schooling families. See The Wanderer’s website, www.thewandererpress.com to buy the book.